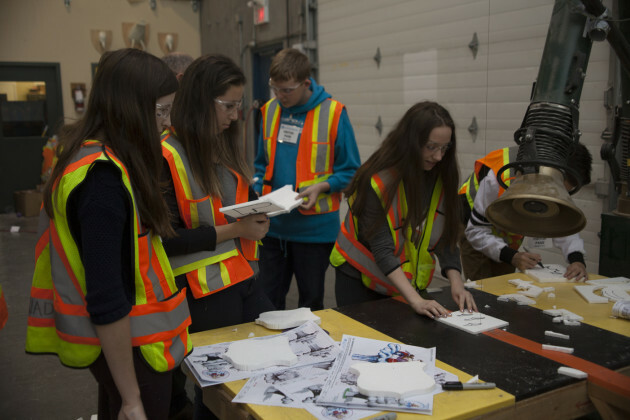 Richmond, BC, Canada – WhiteWater was recognized by The Learning Partnership as one of just 15 companies across Canada for their outstanding efforts during Take Our Kids to Work day, on November 4. The Learning Partnership is a national charity dedicated to building stakeholder partnerships to support, promote and advance publicly funded education in Canada. WhiteWater was named Canada’s Outstanding Employer for their exceptional achievements in guiding and inspiring Grade 9 students to get an early start to thinking about life after school and education to career pathways. Geoff Chutter, WhiteWater’s President & CEO, speaks to each group of kids about the importance of following your passion, as he did 35 years ago when his parents and friends thought he was crazy to quit being a CA to start up a waterpark. After years of perseverance, he now employees over 650 people across 20 offices around the world! Each session of 30 – 60 minutes took the students through a lot of material, but also kept their attention. Seeing how slides and rides are made is pretty fun and WhiteWater made it interactive by giving them the chance to design their own sculpture and use the hot wire to cut it. The children also were allowed a sneak peek of the amazing new rides in development with the product development team that haven’t been released yet, before seeing where their parents work. “They come home with a much greater appreciation for what their parents do, and hopefully how much fun work can be to inspire their futures,” says Chutter.